E. Herbert-Caesari Audio Demonstration on Singing will open your mind to the greatest teaching of singing the world has ever known. 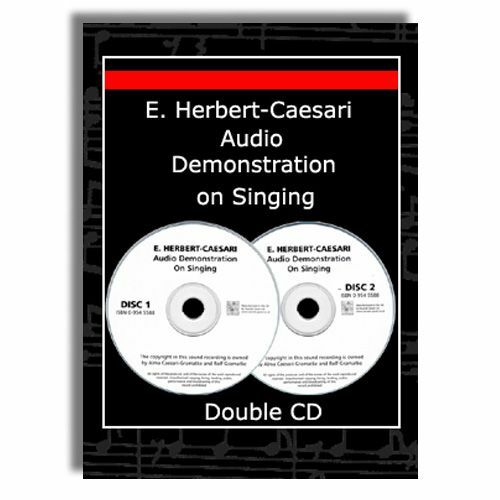 Kept in the Caesari archives for many years, Books On Singing are pleased to present the complete works consisting of 92 singing demonstrations - 2 hours of listening time - as directed by the world's greatest master on singing E. Herbert-Caesari. This is without doubt the greatest and most comprehensive work on the art of singing. Now you have the chance to find out how the great singers studied. As the great tenor Beniamino Gigli said: "In E. Herbert-Caesari's work I found matter of great value. I hope to see his work adopted as the standard study in order to retrieve the art of singing to its glorious traditions". Price includes VAT. Despatched by UK Post Office first class recorded delivery. A bespoke courier service is also available at additional cost - please e-mail your address details and we will let you know if the service is available in your area.